Are you looking to get involved in cryptocurrency or get started with cryptocurrency trading? Coin Market Cap is one reliable source that you’ll find convenient in analyzing Cryptocurrencies. If you are new to cryptocurrency and don’t understand the information displayed in CMC; then this guide will help you to get started. This is not a trading or investment advice. This guide won’t show you how to find out good buy and sell opportunities. Instead it will give you a deep understanding on CoinMarketCap data. 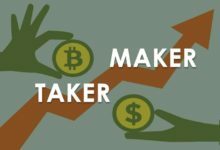 This is a complete beginners guide and a quick explanation on CoinMarketCap. Here we’ll cover what is Coin Market Cap and how to use CoinMarketCap website data effectively. If you are into Cryptocurrency then you often check coins price, analyze the market capitalization and its trading volume. Whatever coin or token it is; the first thing that comes up in search results is CoinMarketCap. This is the website where most users end up to compare cryptocurrency valuations. 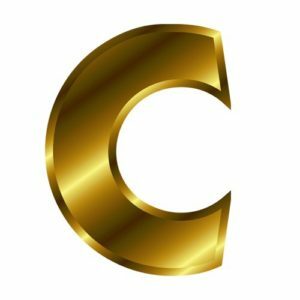 CoinMarketCap is a website / platform to get an overview of the cryptocurrency market capitalizations. coinmarketcap.com isn’t an exchange or trading platform. 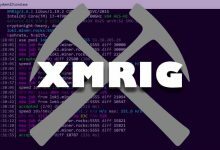 It is just a tool and resource website that provides data on Cryptocurrency price, supply, trading volume, exchange platforms and many other information regarding digital assets. CoinMarketCap is one of the most widely used and the biggest resource website to research Cryptocurrencies. This website provides up-to-date information about the Cryptocurrency market. It is easy to use and this website offers wide range of tools, data, graphs for for both beginners and expert traders. Alright, let’s see how to use this website data to its fullest . 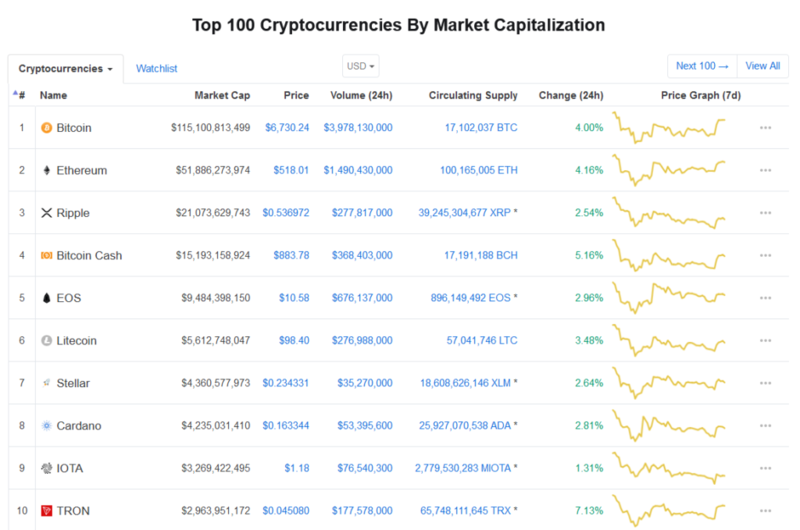 Once you head to coinmarketcap.com the first think that you’ll notice is the table with the list of top 100 Cryptocurrencies by market capitalizations. The table displays the name of the coin / token, its market cap, price, volume, 24 hour change and the price graph of the coin for the past 7 days. What are they and how can I use this data effectively? By default this website uses USD to evaluate Cryptocurrencies. You can change it to BTC, ETH, XRP, BCH and LTC (all short names and symbols of cryptocurrency). However initially to better understand the data listed in the table choose USD. The first column in the table shows the name of the cryptocurrency. This list by default contains both coins as well as tokens. The difference between coin and a token is: Coin is a cryptocurrency, it has its own blockchain and runs independently. 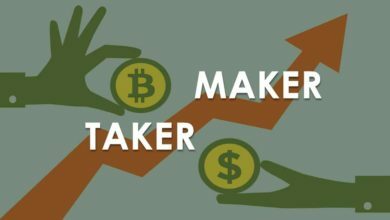 On the other hand Token is either build completely or depends initially on another platform or blockchain. 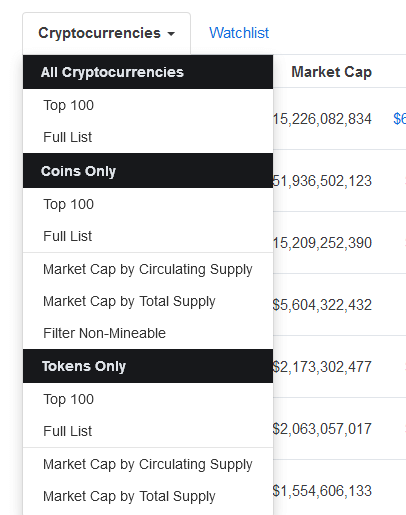 On CoinMarketCap you have an option to exclude coins / tokens from the list. You can choose to show only mineable coins and you can also list the entire crypto currencies that are in their database. Just click on the Cryptocurrencies tab and you’ll see various options to filter Cryptocurrencies. The next column is Market Cap. You can list the table based on different criteria like rank, market cap, price, volume and change. However this website by default ranks coins and tokens based on its market capitalization. 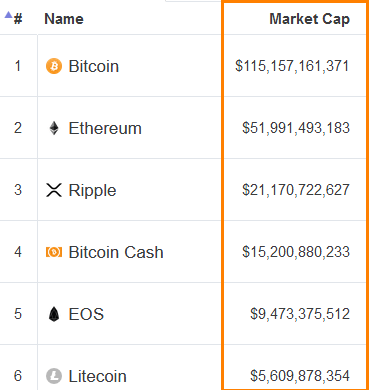 As you can see Bitcoin ranks number 1 in terms of market cap, followed by Ethereum, Ripple, Bitcoin Cash, EOS and Litecoin. Market cap is the total value of a crypto and this is one of the most important unit to consider when evaluating Cryptocurrencies . Price is the current value of a coin or a token. It simply shows how much a coin or token is worth. Volume is the total worth of amount that has been traded over the past 24 hours. For example in the below image you can see that in last 24 hours $3,883,520,000 worth of Bitcoins has been traded. Just click on the volume numbers and it will list all the exchanges where that particular coin has been traded largely. Circulating Supply is the total amount of coins that are in public hands currently. Also if you look at circulating supply then some coins will have a small star (*) next to it which means non-mineable coins. 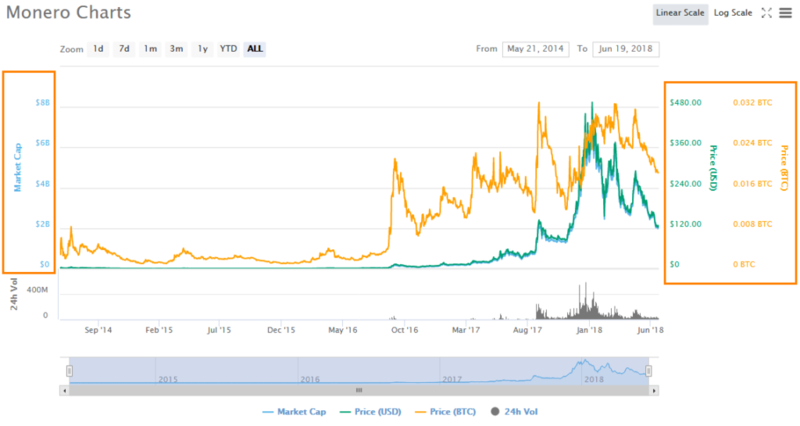 For better understanding we suggest you to read this article that explains a lot about Market cap, supply and Volume. The change in 24 hour value tells whether the value of a coin has increased or decreased in last 24 hours. You can use this column heading to see which coin has gained or dropped in the last 24 hours. Price Graph shows the movement of the coin / token price over the past 7 days. Clicking on the graph will take you to the price chart of that particular coin or token. That’s all there is to explain about the ranking table of Coin Market Cap. Aside from this you’ll find few other useful information on the home page and there are some extra features to take note. Coin Market Cap website has support for multiple languages. 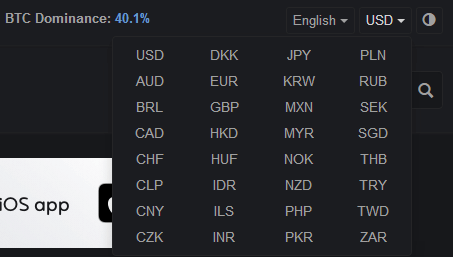 You can choose your native language and apart from USD there are various other Fiat currencies to choose from. In addition to that you can also switch to Day/Night mode. All these features can be found on the top of the home page. On the same line you’ll also find a information bar displaying the total market cap of the Cryptocurrencies in overall. Also it shows the total number of crypto currencies that are listed on CoinMarketCap website so far. 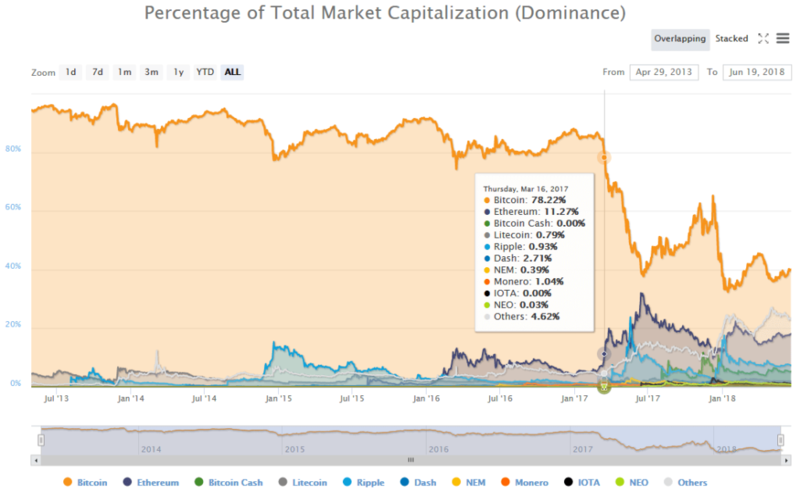 At the time of writing this article there are 1627 Cryptocurrencies listed with a total market cap of $286,519,510,124; out of which BTC (Bitcoin) dominance is 40.1%. Clicking on each of these links will take you to the specific page with more detailed graphs. 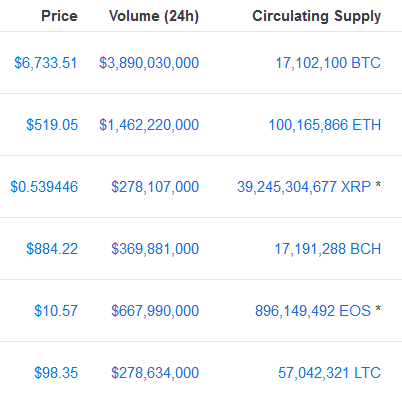 CoinMarketCap not only displays top Cryptocurrencies. But it also displays Top exchanges based on 24 hour volume rankings. Just below the header you’ll find a menu called Trade volume. Just click on Trade Volume and choose “24 Hour Volume Rankings (Exchanges)”. It will display top exchanges based on the trading volume. You can choose crypto to crypto trading pairs or crypto to Fiat trading pairs. Also you can sort out exchanges based on currency wise. 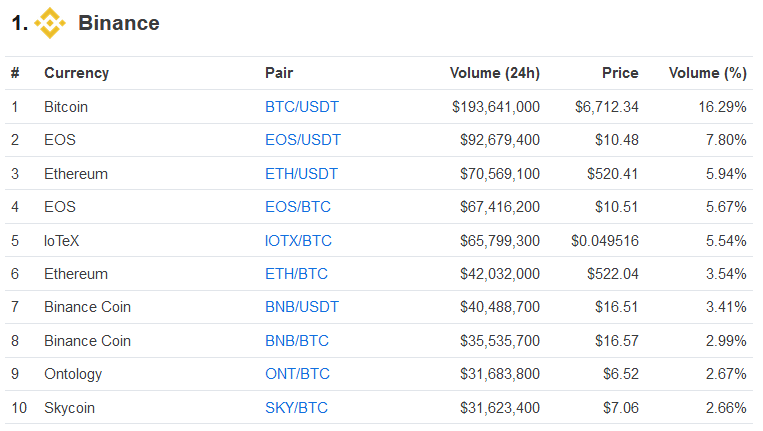 The table displays the currencies, on what trading pair the exchange tops and its total volume over the past 24 hours. This data helps when you are mostly into trading and if you are wondering then Coin Market Cap fetches price data from these markets. Currently there are 200 + Exchanges listed on CoinMarketCap website. 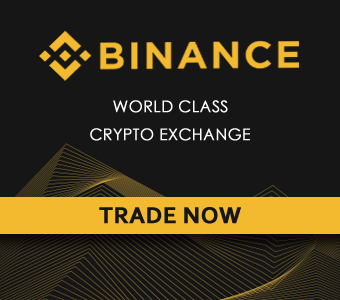 Among them Binance tops the list with a 24 hour trading volume of 1.2 Billion US Dollars. 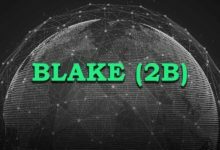 Everyday several new coins and tokes are being added to CoinMarketCap database. 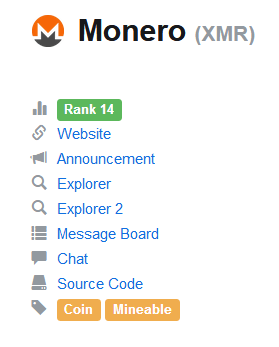 If you’d like to find out new coins and get in early then you can dig through CoinMarketCap’s recently added list. Drop down trending and click on Recently Added to view all the new coins that are listed on CoinMarketCap website. Most of the coins are new to the market; so the market cap and supply details won’t be accurate. Also you’ll find a question mark next to these coins which means CoinMarketCap has not fetched the accurate information of the coins yet. Also on trending you’ll find Gainers and Losers which displays coins that has increased in price and lost its value largely. With all these information you can pick a coin and start doing your own research. 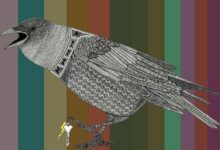 To do in-depth research and to find some useful links about the coin you need to get in to coin specific page. 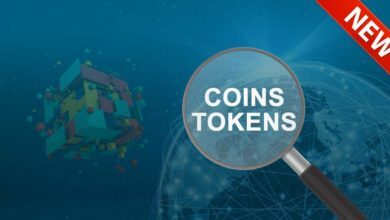 To do in-depth research about a coin you need to find its link and get to know what the project is all about. 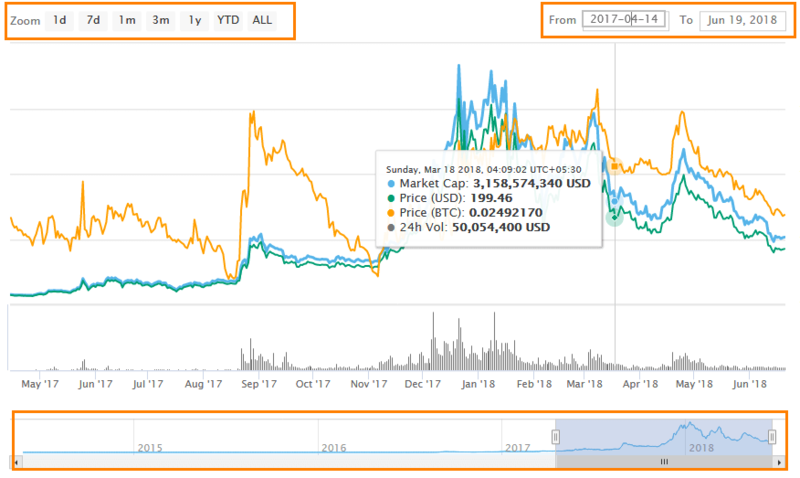 You need to observe the general price trends and see how the coins price have changed from time to time. Analyze its market and historical data completely. 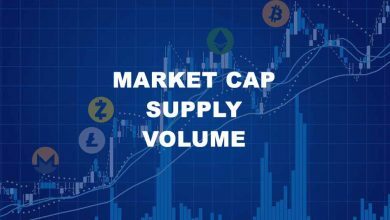 All these information such as useful links, price chart, market and historical data can be found on the coin specific page of coin market cap. Just search your favorite currency or choose a coin from the ranking table and it will take you to the individual page of that particular cryptocurrency. You’ll see information similar to the image below. 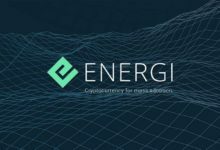 The information shown on the ranking table such as price, market cap, volume and circulating supply is shown on this page as well. Also along with circulating supply some coins have total supply and max supply. If you are new to this then know the difference between circulating supply, total supply and max supply. 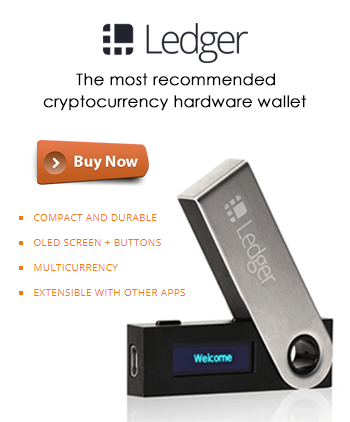 At the left hand side of this page is where you’ll find all the useful links about the particular cryptocurrency. For most coins you’ll find its website link, Bitcoin Talk announcement link, Block explorer link and other social links. Along with these links it also states whether it is a coin or token and if it is a coin then it is mineable or not. 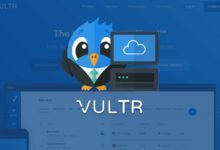 All these important links will make things easier and should help you to get started with the project. 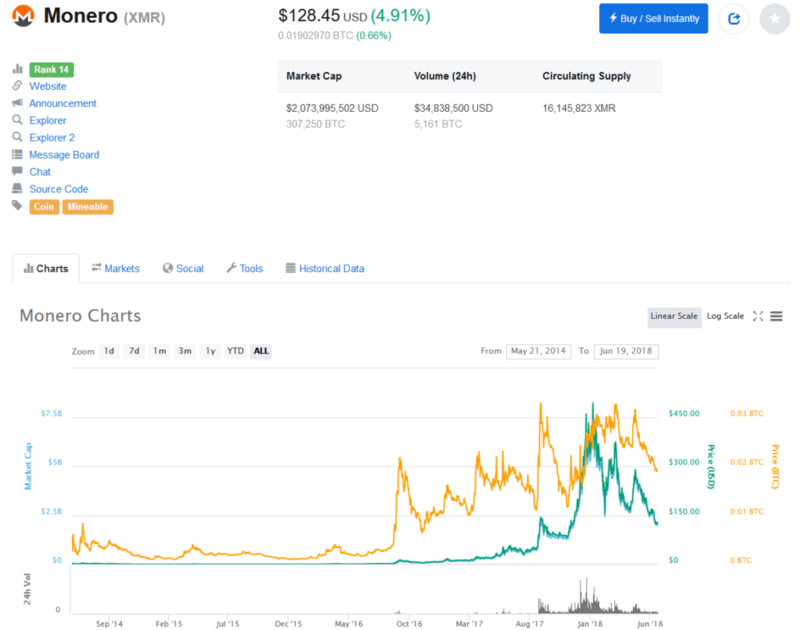 On each and every coin page you’ll find a chart which show the performance of the coin over time. The X-axis of the graph represents time. Whereas the Y-axis shows the total market cap and price of the cryptocurrency. The explanation can be found on the same page below the graph. The Green line represents price in USD, the Blue line is market cap, the Orange line is price in BTC and the Gray one is 24 hour volume. You can hover the mouse on this graph to see the price or market cap of the coin at any particular date. In addition to this you can also use the slider underneath the chart or the zoom label towards the right to view this graph at specific time periods. That’s all there is about coinmarketcap! We hope this guide explains all the basic elements of coinmarketcap. If we missed to explain any of its aspects then you can check out their FAQ page or leave your comments below. While CoinMarketCap is the most dominant website to research Cryptocurrencies; it still lacks many features. For example it doesn’t show live price updates in real time. In fact there are many other better alternatives compared to CoinMarketCap. 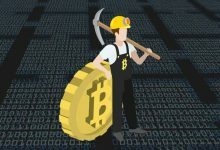 Anyways if you understand the basics explained in this article then you can grasp the crypto market as a whole. If you know how to use coinmarketcap then you’ll also know how to use other cryptocurrency ranking and comparison websites. Remember that coinmarketcap just provides an overview and is a general tool to discover the crypto sphere. In the historical data section of Coin Market Cap, are the high and low prices similar terms to the bid and ask price, respectively for stock quotes? No, those are the highest and lowest traded price for that particular day. 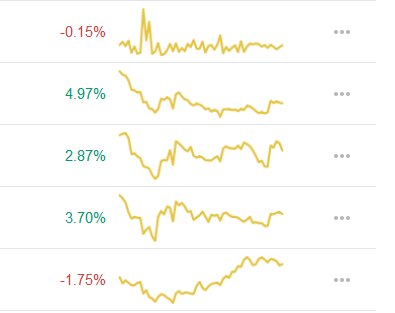 In the market section of coinmarketcap.com, there are some differences in price from different exchanges. Can i scalp through these exchange to make gain without getting burnt? Yes, you can. But you must note that coin market cap does not updates its data real time and in most cases they are not accurate. So do note rely fully on values shown in these sites.